Even though Malé is an interesting city to explore, there is not all that much to see, and it is possible to see everything in a couple hours. Therefore, if I wanted to see more of the Maldives, I needed to head to some of the other islands. Prior to going on holiday, I had previously booked a tour in advance to the nearby island of Villingili aka Villimale, but that was to take place the day before I left. I still had another day before then. Luckily, the tour company I had contacted on very short notice was able to set up a tour to another island with no problems. 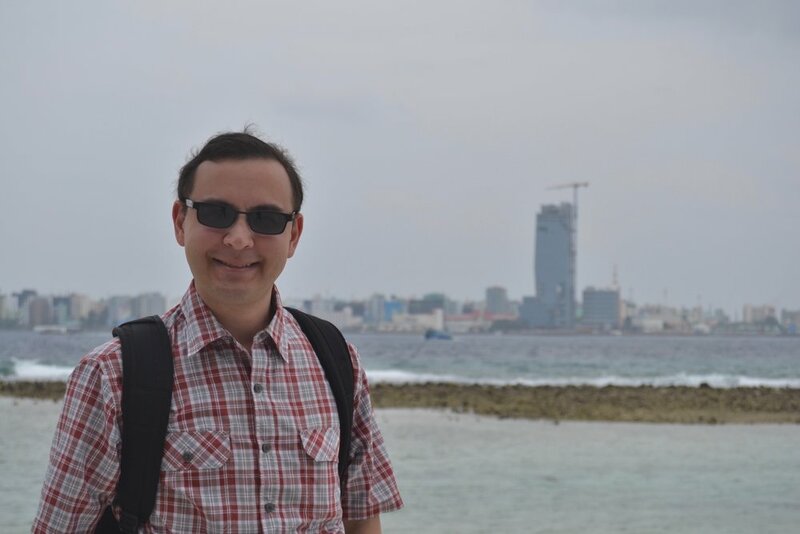 The first island I visited was Huraa, which is part of the Kaafu Atoll. Unlike other tours I have taken where they have typically started in the early morning, this tour started at 2pm. This was because the ferry to the island left at 3pm, and it would not return to Malé until 7pm. Because of the schedule of the ferries, I had the morning to kill until I was to meet the guide in the hotel lobby. Since I had a lot of spare time until the designated meeting time, I wanted to get a better view of the city. Even though I was staying at a hotel in the center of the city, the location did not provide any view of the water. Instead, it was only apartment blocks and construction sites as far as one could see. Hence, in the morning several hours before the tour, I walked to the northeastern part of Malé and headed to the Hotel Jen since I had been told it had a rooftop pool with a nice view. Because Malé is so small and condensed, it did not take long to reach the hotel. It was only about a 10 minute walk. Even though I was not a guest, the hotel staff had no problem with me going up to the roof and checking it out. The only thing I could not do was use the pool, but that was not a problem. I had forgotten my swim trunks anyway. On this particular day, the weather was perfect. There were very few clouds in the sky, and the weather ,while hot and humid, was not terribly uncomfortable. Because I was not sure how long they would let me stay on the roof since I was not a guest, I made sure to try to get as many pictures from as many different angles as I could. After checking out the rooftop pool and views of the city from the Hotel Jen, I headed back to my hotel and spent the rest of the morning and early afternoon relaxing and taking a nap in order to save energy for the tour. The heat and humidity of the Maldvies definitely did slow me down, and I wanted to be well-rested before the tour started. There have been times when I have been on tours and quite tired. It is not a fun experience, especially if there is a lot of walking involved. At the agreed-upon time and feeling well-rested, I met my tour guide in the hotel lobby at 2pm. Since we had an hour to kill in Malé before the ferry departed, he took me to the local fish market, and then we walked around the fruit and vegetable market. Even though I had been here before, it was interesting to get a local's perspective since he explained where some of the products came from and what was commonly sold in the different seasons. I would not have known about these things otherwise. At around 3pm, we headed to the ferry's departure point. It was right next to the fruit and vegetable market. If I had tried to go to this island on my own, I would have never thought that the ferry departed from this point. The ferry was relatively crowded with locals who were heading back to their homes from Malé. The trip to Huraa took about 90 minutes, and during the trip, the ferry passed by several different islands, and it was often possible to see resorts with the famed huts sitting on stilts over the water. It was also during this trip that I began to feel quite nauseous and seasick. The waves were a bit rough, and the constant up and down motions of the boat did not sit particularly well with my stomach. As a result, I spent a good portion of the 90 minute trip with my eyes closed trying to breathe slowly and keep the contents of my stomach from coming up. I also tried hard not to turn my head unless necessary. If I had to be honest, that was kind of a long trip while feeling nauseous, and I was more than happy when we finally arrived on Huraa. Once we got off the ferry, and we started walking, I began to feel much better, but I secretly dreaded the return trip, especially if the waves were going to be just as rough. Since the ferry wasn't going to return to Malé until 7pm, we had a few hours to explore the island, which is not particularly large. 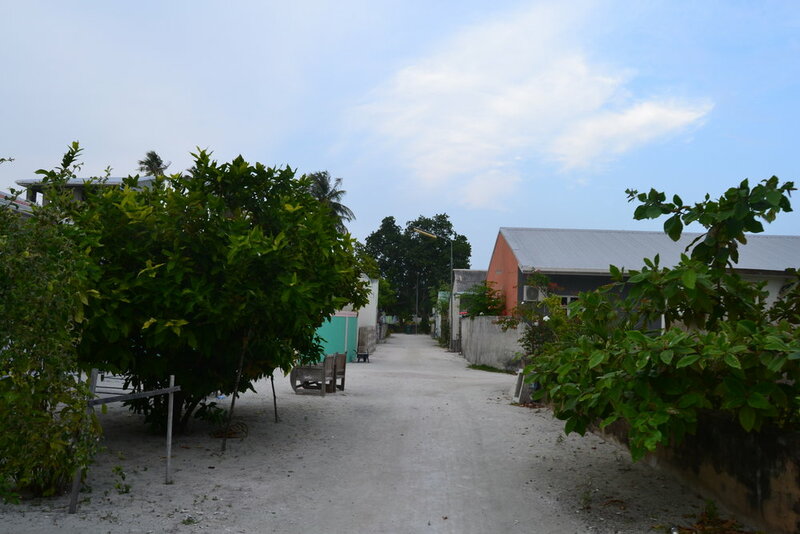 The main purpose of this tour was to get a taste of how locals who do not live in Malé live and to see some of the nature that is mostly missing from the capitol. Since a resort is very close to this island, the guide pointed out that many of the local resort workers actually live here and simply take a small boat across the water each day to go to work. For those workers who do not have homes on the island, they stay in a dormitory style building. From what I saw, there seemed to be only one restaurant that catered to both resort employees and resort guests who wanted to leave the resort and have a more local experience. There were also numerous guesthouses for people who wanted to stay in the town and not splurge on resorts. While the guide and I were walking through the island, the town itself was very low key and quiet. It was in stark contrast to the constant noise of motorbikes and continuous stream of traffic in Malé. Instead, the town was much quieter, and most of the locals seemed to walk everywhere. I saw relatively few motorbikes or mopeds and hardly any cars. In fact, it looked like life was a lot slower here when compared the hustle and bustle of Malé. In terms of facilities, it looked like the town had some essential services such as a power plant, a small police force to cover the island, and a primary school, but I was told that if residents of the island needed items that could not be found here, they needed to go to Malé and stock up. This explained the reason why a lot of people on the ferry to Huraa were bring boxes of all kinds of goods. As we were walking around the area, I thought of what it might be like to teach in a place like this. I have on occasion seen job openings for various islands in the Maldives. On one hand, it would definitely be a unique experience in island living. While that does sound nice and appealing, it became clear that while a potential teacher would have very easy to access to the beach and all kinds of water activities, the facets of daily life could present some challenges, especially if health issues came up or when it came to getting groceries. From what I could understand, the island could offer basic medical services, but if you had a serious problem, you would either need to be airlifted or transported by boat to a hospital in Malé. The same issue would be for groceries. While there were some small shops and convenience stores that sold essentials, if you wanted more specialized items, it seemed to me that you would need to take a 90 minute ferry to Malé, stock up on everything you could, and then head back. I could imagine an expat who decided to make a home here having a relatively simple and relaxing yet somewhat challenging life when it came to the logistics of conducting daily life, especially considering that many ferries do not run everyday and could be delayed for mechanical issues or bad weather. After we explored the island for a few hours, we headed back to the ferry for the 90 minute ride back to Malé. Thankfully, the water was calmer, and the swells were not as high, so I did not feel nearly as nauseous as I did on the way there. Once we arrived back on Malé, my guide took me to a gift shop since I had mentioned earlier in the day that I collected old money. He spoke to the owner of the shop about my interest in old money. The owner disappeared and returned a few minutes later with a set of Maldivian Rufiyaa from the 1960s in plastic sheets. While the banknotes looked genuine, I had a feeling the price was going to be out of my price range. It was. The owner wanted about $2500 USD for the set. There was no way that was going to happen. For one thing, the owner claimed these were the only set he had left, and once they were gone, they were gone. I had no way of knowing that though. There was also no way for me to guarantee these were genuine. I didn't buy them of course. For me, the starting price was unreasonable. If the owner had been more reasonable with the price, I would have been willing to negotiate. In addition, there were a lot of things I could not verify in terms of if they were real or fake, and how many sets there actually were. For all I knew, he had a huge pile of these banknotes in a different location that he takes out when someone asks about it. I've also been around to a fair number of places, and I know these guys make their living like this. They had this down to a science and were experts at making up stories to try to subtly add pressure on a potential customer. While I was willing to pay for one of the banknotes, the owner was adamant about not separating the collection. Since this was not going to go anywhere, I thanked him, and my guide and I headed back to the hotel where he dropped me off. The next morning, I was scheduled to have my second tour, and it was to be with the same tour guide. The tour was to the nearby island of Villingili (Villimale), which is only a seven minute ferry ride away from Malé. This is basically the weekend getaway for locals since Villimale is known for having a beach and more of a tourist infrastructure than Huraa except it tends to cater more to locals than foreigners. Getting to Villimale was extremely easy. Unlike the journey to Huraa, which took 90 minutes in relatively choppy waters, the trip to Villimale was a short 7 minute ferry ride. Upon disembarking, my guide gave some information on the history of the place, and we proceeded to walk around and check out the locality. In my opinion, Villimale definitely was more developed than Huraa. This made sense since it is extremely close to the capitol, and a lot of people from Malé come here to relax on the beach for the day. 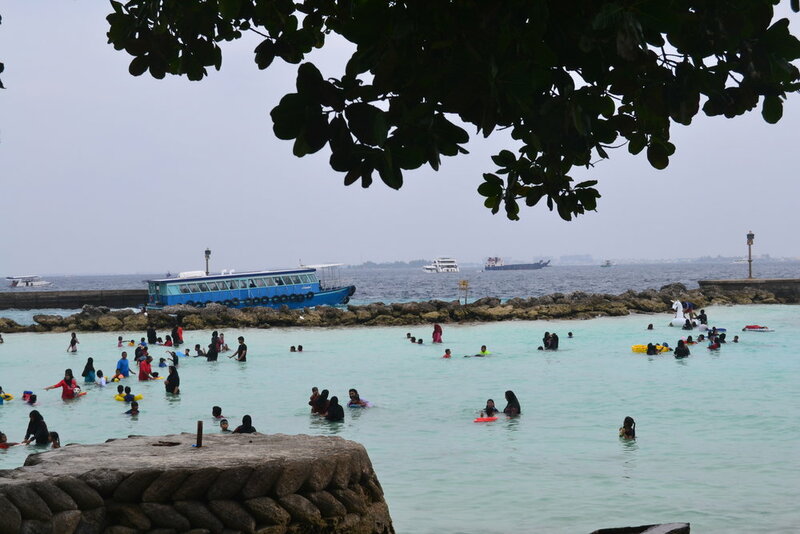 Of course, since this is not a beach that is commonly utilized by foreigners, the same codes of modesty applied here, so it was very common to see the locals swimming fully clothed including the hijab for women. Since it did not take too long to navigate the island, my guide took me to an NGO called "Save the Beach," whose main goal is on educating both visitors and locals on keeping the beaches of the Maldives clean and free from trash and pollution. It was while visiting this NGO that I learned that a dedicated team of local and international volunteers cleaned up the public beaches each morning and evening in order to keep the areas clean and emphasize the importance of keeping their areas clean. It was quite encouraging to see the locals taking this responsibility of keeping the beaches clean on their own and without being told to. In addition to cleaning the beaches each day, the organization actively tries to educate people on why they should not take any sea life such as coral whether it is alive or dead since if everyone took one piece of coral, there would hardly be anything left. After the tour ended, my guide and I headed back to Malé. Once I returned to the hotel, I was quite famished. Originally, I was planning on heading up to the rooftop restaurant for a buffet of Indian food, but it was closed for a wedding that night. Instead, I walked around the city until I came upon a place near the artificial beach which served a mix of Indian and Thai food. I ordered some spicy soup and Thai noodles and then headed back to the hotel. Overall, even though I did things differently in the Maldives than from what most people typically do, I was quite pleased with the result. I didn't break the bank, and I got to get at a decent taste of what life is like here. I definitely hope to return here someday in the future and spend more time in a resort to see what it is like. Please enjoy these photos. All photos were taken by me using a DSLR and iPhone.